On Thursday, April 9th, 2009, Great Day St Louis aired the second segment of my Easter & Passover recipes. This time I created a bunny cupcake that I am sure the kids will love. I hope that you enjoy the video segment. Wishing all of you a very Happy Easter & Passover! vicki, the cupcakes are adorable! 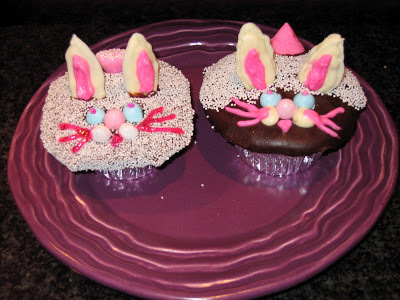 Vicki, I made these for Easter – they were a big hit! My supermarket did not have the white non-pareils, but we found them in the cake decorating section of a Michael’s craft store. Thanks for sharing this cute little cupcake idea!